Combine bruschetta ingredients in a bowl and set aside. Preheat oven to 350 degrees. Spray a baking dish with cooking spray. Combine bread crumbs, 2 tablespoons fresh parmesan cheese and pepper to taste. Dip chicken into flour, then into egg and finally into the breadcrumbs. Place in prepared pan. Remove 1/2 cup of the bruschetta mixture and combine with tomato paste. Place on chicken. Cover loosely with foil and bake 15 minutes. Remove foil and top chicken with cheese. 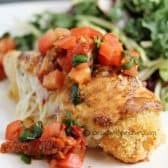 Turn oven up to 425 and bake an additional 20 minutes or until cheese is browned and bubbly and chicken is cooked through. Remove from the oven and serve with remaining bruschetta.